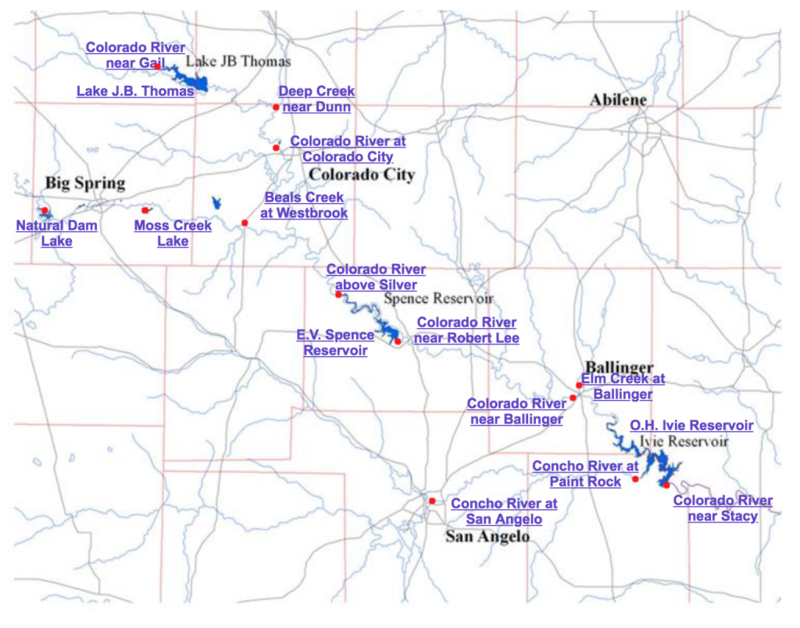 The Colorado River Municipal Water District is a “cooperator” with the United States Geological Survey (USGS) on several stream, river level and lake level gauges throughout the upper Colorado River Basin. The map below shows the approximate location of each gauge. A graph of the last two days flow at stream gauges, or a graph of the last two days water elevation at reservoir gauges can be obtained by clicking on the appropriate locations in the list below. Please be patient, since generating these graphs mat take some time. This operation will take you out of the District’s web page onto a new tab, so use the tabs on your browser to toggle between graphs and this map.